Meguiar's Wheel & Paint Iron Decon, D180101 - 1 gal. Meguiar's D1801 Detailer Wheel & Paint Iron DECON is a unique pro-strength gel formula designed to safely & effectively remove embedded iron particles from body panels, wheels and painted brake components. D1801 is also highly effective at removing road grime, grease and dirt from wheels and brakes, and is ready to use right out of the bottle. The rapid color-changing properties help to indicate that it's working to remove iron from wheels and paint. Despite being a highly effective pro-strength formula, it's still pH balanced making it safe on all wheels and painted brake components. 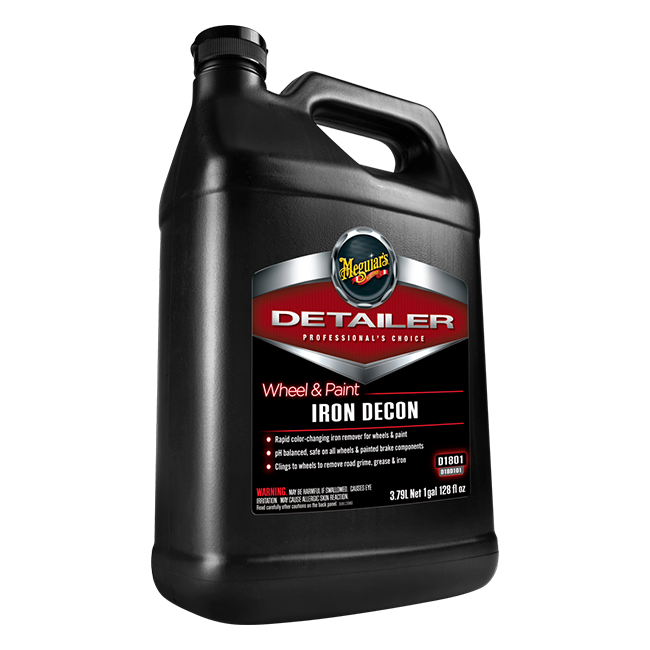 Meguiar's D1801 Detailer Wheel & Paint Iron DECON is safe in a body shop environment and is available in 1 gallon and 5 gallon sizes.